Coronation Park, a former paddock, was donated to the town by Mrs. Godfrey Walker of Scarborough. It was officially opened on 22 June 1911 to commemorate the Coronation of George V. Public subscription raised money to erect a lamp and fountain at the southern entrance to the park at the junction of Castle Hill and Low Road. The combined drinking fountain, horse trough and lamp was unveiled by Mrs. Walker. It was listed as a Grade II historic building on 26 November 1987. This octagonal shaped drinking fountain is seated within a cast iron trough. The single pillar with attic base hosts inset arched panels. 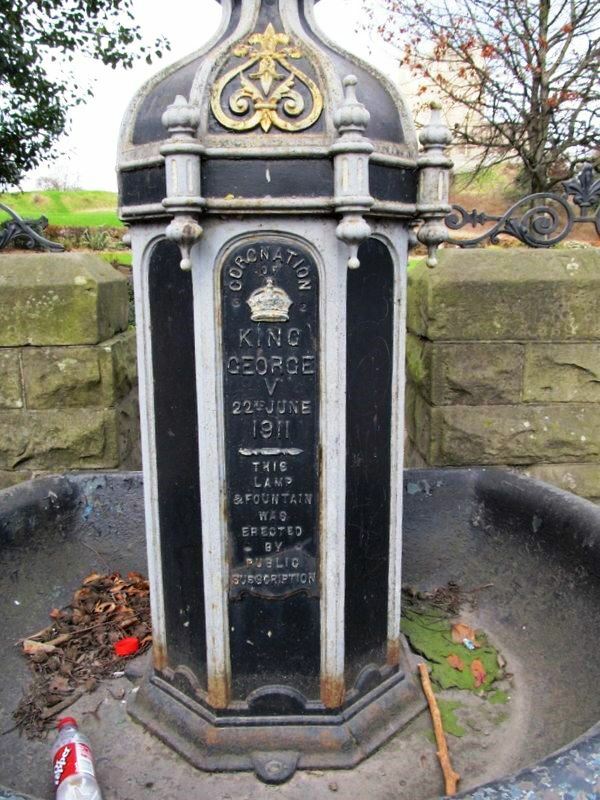 A dedication in the panel states, Coronation / 0f / King / George / V / 22nd June / 1911 / This / Lamp / & Fountain / Was / Erected / By / Public / Subscription. Entablature with bolt consoles sits beneath an ogee cupola with alternate panels of fleur de lys motif. The post and yoke maintenance arms that originally supported a lamp are still in evidence. The six sided glass pane lantern was capped with a ball and spike finial. A small trough at ground level was for the use of dogs. A plaque is inscribed on the trough; Geo. Wright Ltd. / Burton Weir / Rotherham. This company was an established foundry in Rotherham with connections to the Lion Foundry of Kirkintilloch. The trough was added to an existing design (number 27) originally owned by George Smith & Co. (Sun Foundry) which was obtained by the Lion Foundry when the Sun Foundry closed in 1899. This entry was posted on Thursday, July 2nd, 2015 at 12:55 pm	and tagged with Coronation Park, Geo. Wright Ltd, King George V, Mrs. Godfrey Walker and posted in Architecture, BrItish Listed Building, Cast Iron, Coronations, England, English Listed Building, Memorial Drinking Fountain, Sun Foundry. You can follow any responses to this entry through the RSS 2.0 feed.